How do you move a crane? You’ve seen them in action: towering cranes lifting concrete slabs hundreds of feet into the air. But where did the crane come from? How did it get to the job site, especially in the middle of a busy city? With as much work as it takes to get a crane safely erected in place, almost as much effort goes into getting the crane to the site, to begin with. NessCampbell has its own Heavy Haul Division to make sure our cranes get to where they’re going. We have a variety of transportation options, capable of moving our cranes to any job site. Instead of trying to find a transportation company to get the crane where it needs be, we take care of it ourselves. We have specialized hauling equipment with capacities up to 160 tons. This saves time, money and planning. In addition to getting the cranes loaded up, permits also need to be secured before any trip. We’ve done work all over the Pacific Northwest, so we understand the permitting process. States have permits for all kinds of weights, heights, and lengths as well as divisible, non-divisible, and oversize loads. NessCampbell always inspects our loads to make sure they meet requirements and take into account all safety requirements. If we can’t move a crane safely, we won’t move it. Moving a crane is much more than just loading it up and heading on down the road. In urban areas, some turns may not be navigable, power lines could be in the way, and narrower streets may create difficulties. NessCampbell takes great care in planning every route, consulting with local officials to plot the safest and most efficient trip. Even driving on the highway driving can present problems as low bridges and overpasses need to be addressed. Weather, the grade of any given road on the way, and road conditions play a part in the transportation process, too. Which makes NessCampbell an attractive crane operator throughout Oregon and Washington. With eight locations, we’re never too far from your construction site. This cuts down on travel time as well as the number of obstacles we’ll encounter. We also know what city, county, and state requirements are for larger loads, saving time and headaches. Even with cranes that can be driven to the job site, many of these considerations are still in place. Getting your car stuck on a dead-end road is one thing, just imagine if that car was 60 feet long and weighed hundreds of tons! 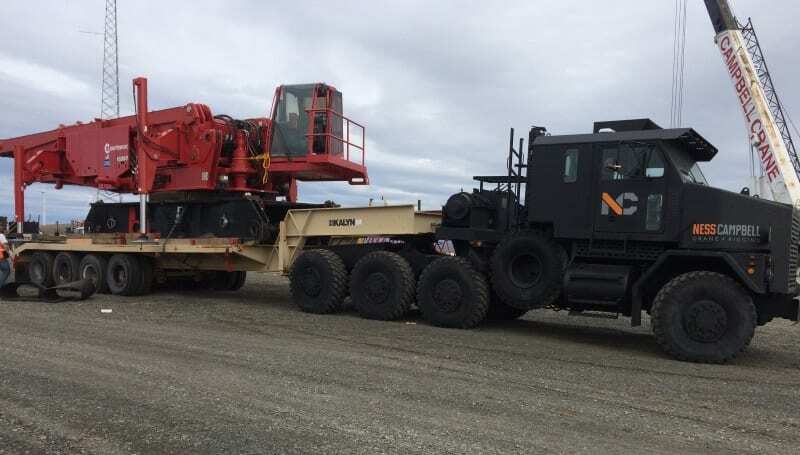 At NessCampbell, we have the crane you need - and the way to transport them - for most jobs in Washington and Oregon. Have a big construction job on the horizon? Contact us today to find out how we can help.